Do you need roof repairs in Salem, Oregon? Hire a trusted contractor for your emergency repairs. Whether you need emergency, same-day roof repairs or simply have concerns about an odd looking spot in your roof, our certified Salem roofers can help repair and protect your roof from further damage. It’s best to be proactive about keeping up to date with your roof maintenance and repairs, because smaller problems can quickly lead to big and costly problems if they aren’t taken care of quickly. If you notice shingle lift, missing roofing materials, poor drainage, or any of the other common roofing problems, you need to contact a trusted Salem roofing company as quickly as possible. In choosing your contractor, be sure to check online reviews, Better Business Bureau ratings, and ask for referrals. There is no harm that can come from being too thorough, but a lot of harm could come from not doing your research. We are often called out on roof repairs in Salem where the home or business owner went with the cheapest bid, and they end up looking at either expensive repairs or full roof replacements, which ultimately cost more than having chosen a quality contractor to begin with. Get an expert opinion on your roof repairs. 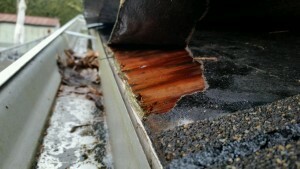 Sometimes the damage we’re called out to repair is so extensive that it makes more sense to do a full roof replacement. In these cases, we discuss all of your options with you, but we often end up applying repairs that will protect the roof from further damage, and we provide an estimate for a full roof replacement. We always encourage homeowners to receive second opinions and ensure that they hire the right Salem roofers for the job. Learn more about hiring the right roofing contractors here. We have an “A+” rating from the Better Business Bureau, maintain excellent ratings on Yelp and Google, and are fully certified, licensed, and bonded. We pride ourselves on our trustworthiness and the value we bring to our customers. We recently had to get a new roof after finding black mold in a 25 ft. section of our attic that had no ventilation. It was so bad, they had to take all of the old decking off and put down new plywood before the roofing materials were put on. They took off all the decking (as requested), not just where it was rotted through. This gave the whole roof new life. They also saved us quite a bit of money by having the mold mitigation people do their job when that part of the roof was off. They solved the poor ventilation by installing a ventilation system on the ridge line and ventilation lines going from the bottom edge of the roof to the top. The roofing material looks wonderful. They also put special flashing around all pipes, the chimney and where the garage meets the house. To us, it showed great attention to detail. They came when they said they would and cleaned up as they went along. All workers for Slate and Slate Roofing are certified to work for this company. This means they ALL have to have the same training. We were pleased with the whole process. Contact us today for an estimate on your roof repairs in Salem by giving us a call at (503) 585-2338, or by using the estimate request form on the right hand side of this site.